Two excellent documentaries at this year's Tribeca Film Festival remind you of the terrible reality of the American prison system. "Every day is exactly the same, exactly the same, every day is exactly the same. In that cell by yourself, you're not in prison, it's like you're somewhere else, you're just away from life, you're just away from life, period." "How many people go into jail and come out different because of what they see?" Monica Grier agreed to support her ex-husband Kenneth Anderson as he re-enters life after serving 14 years in the Soledad State Penitentiary. Prison changes you. By most accounts, being inside is a frightening experience, traumatizing and transformative. Life in prison is brutal, breeding hopelessness, exacerbating anger and anxiety. Whether you remain inside or get out, you cannot escape the ongoing, debilitating effects. Data and history tell us that the American prison system needs changing. But even as this seems self-evident to anyone who thinks about it for more than a moment, and even as legislators and political candidates make noise about prison reform, the state of prisons in the United States is getting worse. Two new documentaries screening at this year's Tribeca Film Festival remind you of this terrible reality, coming at it from very different starting points. 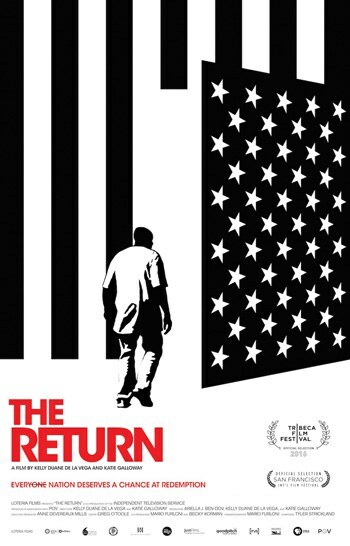 Kelly Duane de la Vega and Katie Galloway's The Return follows inmates released from California prisons following the 2012 passing of Proposition 36, which amended the state's onerous Three Strikes law, while Kristi Jacobson's a href="https://tribecafilm.com/filmguide/solitary-2016">Solitary observes prisoners serving log sentences, in solitary confinement, at Red Onion State Prison in Virginia's Wise County. Both films make clear the devastating effects of longterm incarceration. Monica Grier and Kenneth Anderson have hopes at the start of The Return. When his release is announced by a judge, she and their adult daughter Kaylica sit together in the courtroom, the camera framing their reactions, smiles and tears, relief and maybe surprise, all at once. Kenneth's release is premised on Monica's participation, her agreement to provide, initially at least, a place for him to live, transportation, and a sense of stability. From here, his attorney Mike Romano argues -- and hopes -- Kenneth will find a way to reintegrate into a culture that has long ago moved on. Kenneth is one of "thousands of lifers [who] became eligible for release" with Prop 36, Romano explains, one of thousands who've imagined this day for decades and now face it with some trepidation. Or again, as Monica phrases it, "I always told him, 'Take care of you. With all that you're seeing, if you don't, its gonna break wide open." Romano and his team work on many of these cases, scrambling to keep up on the first part -- getting prisoners released -- and also determined to provide the second part, help in the reentry process. At the Amity Reentry Center, dedicated workers gather around a table, making plans, arranging for resources, anticipating problems. "So many of these guys want to go back to their families," Romano says, but he advises them not to go back. "Prisons are torture," he reminds you. They create in inmates "a sense of helplessness, violence and terror and fear." Home is now an idea more than a reality, and loved ones can't fathom what you've been through. Returning prisoners dealing with PTSD need professional help, and so do their families. Kenneth meets his young granddaughter for the first time, faces resistance from his youngest son (who has a pregnant wife, so he's thinking about raising his own child). Kenneth has trouble finding work. Romano knows this story too well, the challenges and the frustrations, the many ways a return can go wrong. In addition to Kenneth, The Return also follows Bilal Kevin Chatman, who served 11 years of a life sentence for selling $200 worth of drugs to an undercover agent. Bilal goes to a halfway home, where he lives with other returning prisoners, men who've been through the difficult stages of reentry he now faces. "I am overwhelmed and stuck right now," he says, "I don't know what to do. I'm on a couch." And there he is, center frame, his smile wide. His new roommates welcome him warmly, the camera close on their faces as they embrace him, slap his back, read the house rules ("No cursing permitted at any time, no visitors unless authorized by staff"). When Bilal goes to visit his aging mother, now bedridden, you're aware of the time he's missed, the burden of responsibility he carries. "I felt like she was never gonna have the opportunity to see the morals and the goals that she instilled in me," he says, as he washes her hands, tenderly. At the same time, Bilal is all too aware of the risks lurking just outside any door: "Being back triggers a lot of things," he adds, "Brings back a lot of memories." Such intimate moments reveal that prison lives on inside former inmates, shaping their emotional and spiritual lives, not to mention their daily existence: finding employment is difficult, making the narrow windows of parole officer appointments can be hard, as these tend to be scheduled during work hours. "If I don't find a way to break the rules at my job," Bilal observes, "then I will be in trouble with him." At the PO's office, he's subjected to urine tests, long minutes of intense surveillance framed by suspicion and humiliation. Kenneth and Bilal have both been punished in prison. And now, their losses -- of dignity, self, trust -- pervade their lives outside. "Why," asks Bilal, "is my criminal history always going to be at the forefront of who I am?" Inmates who don't get out don't even pose that question. Solitary (coming to HBO in September), observes their experiences from multiple angles, tracking men as they shuffle in shackles, peering at them through tiny windows in their cell doors, the tight framing emphasizing inmates' lack of movement, vision, and visibility. A supermax facility, designed with solitary confinement in mind, the Red Onion State Prison keeps most of its denizens in 8x10 cells for 23 hours a day, restricted to "seg", or segregation. "The main thing that seg means to me," observes Randall, "is extreme loneliness and boredom. That’s the main thing, loneliness. It don’t matter how tough you are, It gets to you and it hurts like hell." While the prisoners don't talk to one another, they do regularly interact with corrections officers. Still, "The COs can't understand. They're here half the time we're here," says Michael Kelly, originally from South Central LA, where he learned violence as a way to conjure family, to feel any sort of connnections. His story is familiar, but no systems in sight are designed to address exactly that, the pattern and the cycle everyone can see. "They leave, they come back," he says of the COs. "This is our world." A couple of interviews with COs suggest he's exactly right. The guards understand their job as control and survival, as maintaining order. "That isolation would be something I don’t think I could deal with either" says one. A unit manager adds, "I don’t think I've actually thought about it as far as how I would act if I was behind the door." Following a brief scene showing a prisoner who appears unable even to raise his head to answer a question about the lunch he's not noticed, a mental health supervisor appears in his office. "There have been studies that say that segregation can have harmful effects on a person's mental health," he says, "But I haven't really probably been in the system long enough to witness it." No? It's hard not to think that he has not been in the system at all, and he's just "witnessed it", categorically. Yes, the documentary sets your own chain of thought and feeling in motion, it makes a case against solitary confinement. How could it not? Again and again, you see that the inmates interviewed for Solitary are deprived, not only of space and human contacts, but also of hope. Doors slam, chains clink, men wail. As confined as the camera may be, it yet misrepresents what this must be like, as the film can cut, the interviews create a sort of fabric, a fictional community of feeling, if not actual relationships. That fiction can help, of course. But the institutions in The Return and Solitary don't begin with that notion. Prisons in the US don't even pretend to rehabilitate. They confine, they curb, they beat down. And they go on.